Straight punches are supposed to be faster and longer leaving you less vulnerable than curved punches…but only when thrown correctly. Somehow I managed to box for years before being taught how to throw a straight punch. I thought I knew how to punch so I was surprised when my trainer showed me why my jab and straight right were actually slightly crooked. How do we know a punch is REALLY straight? There’s more to a straight punch than simply a straight arm. If you do it wrong you’ll lose out on strategic advantages and may even hurt yourself. There’s a way to guarantee that the fist will travel in a straight line and that the power generated is exerting force in a straight line. Let’s dig in a little deeper to see what makes a straight punch REALLY straight. The KEY to Straight Punches: Stretch the INSIDE of your arm! Do you see the subtle difference between both versions of the “straight punch”? Stretching the INSIDE of the arm means stretching with the bicep/chest muscles and reaching forward with the big knuckles. Stretching the OUTSIDE of the arm means stretching with the tricep/back muscles and reaching forward with the small knuckles. Now let’s step back and see how these seemingly tiny differences can affect the way you fight. …making way for an easy RIGHT HAND! The left hand flicks back home effortlessly and makes room for the right hand to come in. Notice how my chest was stretched while I threw the jab. It’s as though my straight jab was pulling in the straight right. DEVASTATING! …this causes the arm to rotate to the inside. Do you see the problem? What happens here is the arm will most likely curve into a slow recovery (instead of flicking straight back). Because I stretched the outside of my arm, my body rotates away from my opponent making it harder to follow-up with another punch. The fist has even swung inwards further blocking my right hand. Now some might argue that this extra rotation will make the right hand stronger because it has to swing harder. Well that makes sense but you might appreciate a faster 1-2 from time to time. WARNING: at the higher levels of boxing, rotating your head off the jab could get you knocked out! The reason why is because your head has to turn back when you throw the right hand. And the best counter-punchers will catch you with a right-cross while you’re head is rotating into it. This is part of the reason why you should avoid turning your jab into a left cross. Good form will deliver more power and reduce the chance of injury. By stretching the inside of your arm and reaching with your big knuckles, you are hitting with a straighter arm. Throwing *crooked* “straight punches” will hurt your hands because the fist swings inwards (even if only slightly) and impacts on the smaller knuckles. This mistake alone is the cause of many common hand injuries for beginners! The straighter punch arrives faster and has less recovery time because it bounces straight back at you. A *crooked* “straight punch” has that looping effect where it swings off to the side requiring you to spend more energy to recover the hand. By the way: a straighter punch has much less telegraphing making it appear faster to your opponent. A straighter punch can penetrate your opponent’s defense better. A straight punch can truly penetrate up the middle whereas a slightly curved one gets deflected away. Worst of all, you don’t want a straight punch to over-rotate you so much that it slows down your follow-up punch. 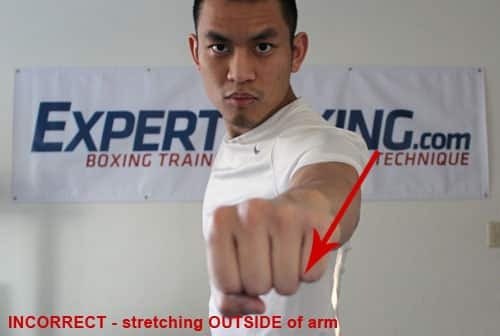 *** Why Do Some Fighters Stretch the Outside of Their Arm? Some fighters do it because they’re trying to get extra reach or extra power. Others don’t know how to punch and so it’s more natural to swing wide than to punch straight up the middle. 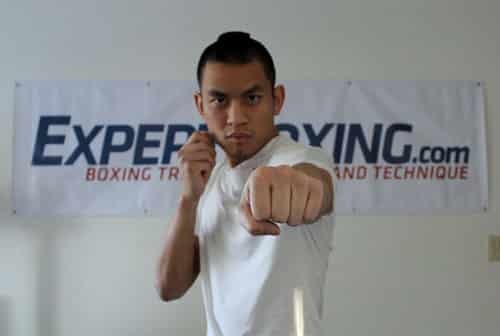 The biggest risks of stretching the outside of your arm is landing on the smaller knuckles (instead of the first two), and also that you might be pulling yourself off balance and slowing your follow-up punches. It’s not improper technique to stretch the outside of your arm when you punch. Just know that this curve your punch slightly. There’s no right or wrong way to throw a straight punch. The tip I gave is to help you throw straighter and to be more aware of your form. Just know that if you stretch the OUTSIDE of your arm, the straight will most likely curve into a cross. If you want a cross, throw a cross but if you want a straight, throw a straight. I’m here to open your eyes to different technique not change your strategy. The more techniques you know the better. Some of you may be wondering why it has to be stretching the inside vs the outside. Why can’t you throw a straight punch with both sides even? In theory, it makes more sense to stretch both sides evenly. In reality, your torso naturally rotates your shoulder inwards when you punch so it’s best to counter-act this rotation by stretching the inside to create the “straight punch effect”. 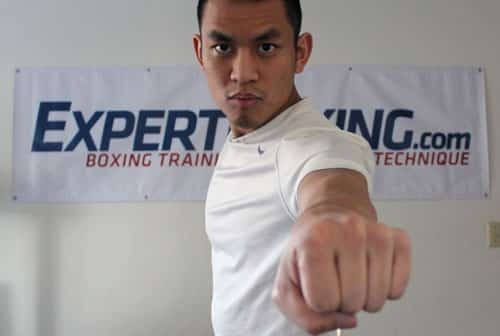 If you’re new to this straight punching technique, don’t straighten your arm so hard (especially while warming up with shadowboxing). You’ll risk hyper-extending your elbow which hurts like hell. I just started boxing in December. I have been sparring for 4-5 weeks now and I am going to compete soon. I really enjoy your website, it is very beneficial to read while I have time at work to be an athlete of the sport. Reading up so I can use some of your pointers in the ring. I hyperextended my elbow (cross arm), so I am going to be a jab machine for a week or so until it feels good enough to punch without much pain in my right. I fight in 4 weeks so I don’t want to take too much time off sparring but I don’t want too much long term problems, either! Such a fine line! I wish I would have read this article a while ago. I have a long range so I still am trying to figure it out. Unforunatele I have to deal with a hyper extended elbow so early in my boxing “career” (not really a career- but ya know!). SO- ALL- listen to him in this, hyper extended elbows ARE VERY PAINFUL! Good luck with your fight by the way. Come back and update me! I will rephrase the question. I’m happy to see it’s helping. i think i am hyper extending my elbow’s hv any advice? Maybe you are twisting too early. I used to have the same problem, it took me time to develop control on my punches. Try to twist near the full stretch of ur punch. Stop doing it. Focus on extending the fist and not on extending the elbow. It helps to do joint warm up exercises before you start your boxing workout. Except for Russ Anber, most trainers have you left jab the left mitt. I think that would also contribute to the outside stretch on the jab, no? Yes! 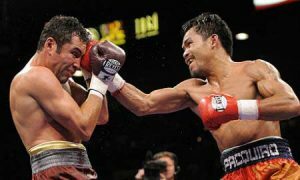 Well many trainers do have you jab the left mitt because they’re trying to save their right mitt for your right hand. It’s not wrong or anything, they’re trying to develop a good working rhythm. And it’s true that many trainers have you jab the right mitt because it builds the habit of extending that left jab. Saber! I remember when I first told you that. Right when I wrote it I knew I’d be making an official article some day for it. You were the inspiration for this—thanks. This was one of the first things I was taught back when I was doing ITF Taekwondo and Goju Ryu Karate (where we broke boards with our fists and often sparred bare knuckled, punching wrong came with painful consequences). All punches should be executed with a straight wrist. In other words the SLIGHT emphasis is on the wrist rather than the elbow. 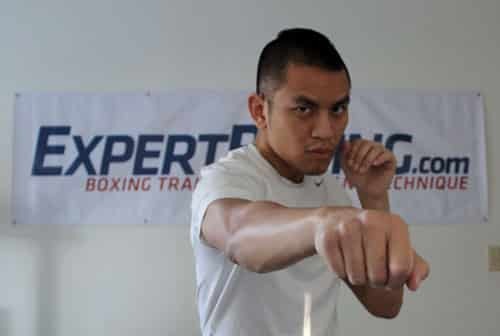 Executing a proper punch is about feeling, what you should be feeling when throwing a straight punch is a light stretch across the pectoral muscles (or chest) and a subtle stretch in the inner forearm. What you shouldn’t be feeling is a stretch through the elbow and wrist, if you are then chances are you’re hyper extending. Its very important that you keep your elbow and wrist relaxed when punching, otherwise you’ll end up seriously hurting yourself. Think of your wrists and elbows as shock absorbers, in punching they should be firm and relaxed but not tight or sloppy. An easy way to develop a feeling for the straight wrist is to make a fist and place it up against a wall, put your weight against the two big knuckles of your fist while avoiding contact with your two little knuckles. Your wrist and elbow should be reasonably relaxed enough to handle the pressure of your body weight resting against it. Once you have developed the basic feeling for the straight wrist using this exercise, next pop on some hand wraps and have a go with some LIGHT drill work on the heavy bag. Having a straight wrist or not might not matter so much when you’re in the ring wearing 16oz gloves with well wrapped hands underneath, but its very important that you get into the habit in practicing good technique. Subtle details can make a world of difference in the long run, and if you value your bones and joints its worth paying attention. It’s explained in the images and video above. To stretch the inside is to reach with the inside knuckle (bicep/chest) as opposed with the outside knuckle (tricep/back). Thanks…… your reply/ the video cleared it all up. Sorry I couldnt watch the video last night when I asked you because I got an error on my phone. Anyway, thanks for this I will put it into use tonight. Wow, I think I’ve found out what I’m doing wrong now with my straight punches. This is really helpful, I’m glad you put up the video also, because at first I was like what is he talking about haha. But I’m definitely going to try this in the gym tonight when I’m throwing straight punches. Thanks Johnny, you’re a boxing guru. Isn’t there a danger of hyper extending your elbow? Kane. Did you read the full article? It’s not too late at all! Good luck, Mke. Mke, You should try. 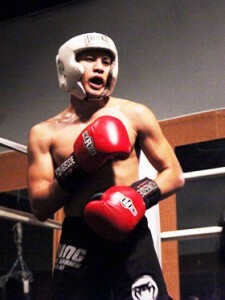 I will have 37 in two weeks from now, and i will definitely go to boxing. Mostly regarding to Johny and his excelent explanations, i started some room shadow boxing, and i’m definitely satisfied with it. Johny, many many thanx 🙂 ! i’ve been reading ur articles here since last year.this is the 2nd comment. And i must say. i’ve learned so many things and most of the techniques that ive learned helped me alot on my 3 previouse fights. im on crucial training right now for my fight this May. i cant wait to practice the other way of using straight punch and slipping techniques. thank you so much for giving advised on how to be a better boxer. I also need ur expertise on this one, its been a long time but i still cant find my perfect balance. ending is whenever i try to initiate a power punch its not giving any power at all like im kinda like holding back my punches. funny thing is when im doing mitts im actually ok but comes to sparring, man! i look awkward!!! im still not getting it right. hope u could help me on this one johnny. thanks!! keep up the good work! Shadowbox some more. You’re too use to relying on the impact to bounce you back onto balance. And then of course in sparring, you miss a lot which means you’ll swing yourself off balance. 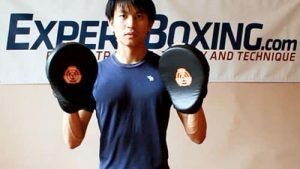 Work on shadowboxing and punching at the air so that you know how to rely on yourself for balance instead of the impact. How about hook punches & uppercut Johnny? Good question. That will be in a future article, Alex. Great article Johnny, quick question. Do you stretch the inside of your right arm when you throw your right hand too? Assuming you are orthadox. If you want to throw it really straight, then yes. I’ve been working a lot on throwing straight jabs. particularly on sitting the chin snug with the shoulder and aligning eye – shoulder – fist – target in the throw. Your tip on the inside-arm stretch concept has seemed to add the missing piece of the puzzle, particularly as it forces the elbow towards my centre line and avoids the chicken wing elbow I’ve been trying to correct. My jabs are now cracking nicely, feeling like I’m punching a nail straight into a board on impact. Much appreciated. Beautiful. It feels great, doesn’t it? What do you think about the top of pulling the oppositie shoulder back when throwing straight punches? Like with the jab, pulling the rear shoulder to shoot it out straight while keeping you weight back. Thoughts? That’s an advanced concept and works well with some punches but not others. There’s a right way and wrong way to do it. The wrong way is to imagine that you’re swinging both sides of the body. The right way is to imagine that one side is connected to the other and one leads the other. Man, I got to say, for someone (me) who trained on his own for years, and just started really training at a gym, this is the best instruction I have ever gotten. Having taken up boxing on my own for exercise a couple of years ago, I never really knew how to through a really good feeling jab. I always felt as if I was throwing it weird. Until I came across this article. Without a doubt this was this best advice on throwing a jab I have ever encounter after scouring articles for years. I have only been doing the technique sense you posted and I already feel a massive difference in speed. And when I throw my right, it feels alot better. Keep the great articles coming. I concur with the person above that I would love to see an article on uppercuts and hooks. I would also love to see some good double-end bag instruction. Keep up the awesome work. I would just like to get your thoughts on: What if moving left while jabbing with my left? It seems that this technique is only for forward movement. If I’m slapping your jab with my right and countering with my left jab while moving to my left, the jab stretching from the outside seems more piratical. The technique is for straight punches, not for forward movement. This technique should generally work in any scenario where you need a straight punch. If you want a rotational punch such as a countering with a pivoting jab, then you would rotate the body more than stretch the in side. This guide is really to teach you a technique and not so much the strategy. Use it wherever appropriate. Stronger legs, stronger core. Start there. I also wrote a guide on fighting muscles. Check it out. Recently I have had to spar someone who used to be a brown belt in karate, and his guard is lower than a boxing guard.I have little experience as I have only been boxing for around 2 months. We are both around the same height- 5’9″. Do you have any tips for me? None other than to keep training and be patient. With time you will learn many things naturally. Hey Johnny, I feel sometimes as if Im forcing my straight punches and i can some what feel myself leaning over my front and not pushing off my back foot any suggestions? Project your power down, not forward. Your body weight goes down while the fist goes forward. This will keep you balanced while adding power. So I bend my knees or drop with with every punch? i like to start boxing..
Get a coach or anybody who knows more than you and start learning everything you can from them. You can also read the articles on this site. I have to say I’m really enjoying your site, man! My comment isn’t a criticism at all on your post, by the way; it’s just an FYI that has nothing to do with in-the-ring boxing. I hold degrees in a couple of martial arts and in those arts in which trapping and limb destruction are emphasized, doing this is actually dangerous. In the ring, with rules, I’d say it’s excellent advice, but on the street if ever needed, maybe not so much because you never know what another guy on the street may know or use. 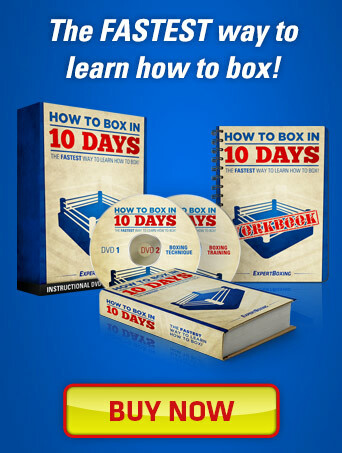 Since I read your site but don’t personally have aspirations of competing in the ring, I imagine your overall audience may have a few like me who just want to know more about the sweet science as it applies in self-defense, without rules. A really basic limb destruction is to parry or slip a punch to the outside, control their wrist with your rear hand, while you hyper-extend (or break) their elbow with your own vertical elbow strike (kind of like throwing an uppercut with the intent of striking with the elbow). That said, what you show as incorrect is actually safer in these instances because the slight flex may be the difference between having a broken arm or one that’s just sore from having absorbed a big hit. Again, REALLY enjoy the site and look forward to your posts. Much continued success to you! Thanks for the feedback Marc. In reality, every move you make can be both an advantage or disadvantage. When used at the right time, it helps. When used at the wrong time, it leaves you vulnerable. The technique being taught is simply a technique shown to teach people how to achieve a certain effect. If you go out and use it as the rule for all straight punches, then yes you will have inadvertently created a vulnerability for yourself. I know what you are saying about limb destruction, especially joint locks. I have taken Pentjak Silat, Aikido, and Hapkido (a total of 9 martial arts including boxing), I am taking 3 currently, so whenever i see a move in any discipline I always ask myself, and sometimes even the teacher if there is time, what other systems would do or how they would respond to that technique and how it would apply in a street situation and really what would the perfect hybrid system look like. Anyway, applying this thinking to your question i would say that if a jab was done with good technique as Johnny is saying, that it has good form and is practiced to be fluid and fast and whipping then it would be very difficult to catch it for limb destruction, especially if coupled as it should be with good footwork. Furthermore, if someone were to go for an inside guard trap and the boxer was versed enough in combo attacks to throw say a 1, 2 then the trapper could walk right into the 2 and go lights out. Anyway, if you are interested in these kind of things check out my website at tacticalboxing.com. Love the facial expression man! LMFAO! Keep up the good work too! I always come back to this page when I lose my boxing roots, and need to go back to the basics! I haven’t been boxing too long, maybe a year and a half or so. But I have never thought of this concept or heard of it before- stretching the inside of your arm. Thanks for this and so many other insights. It makes the sport so much more fun to be able to learn outside the ring. i actually accidentally figured this out the other day.it doesn’t just make your punch straighter but helps with snap punching instead of push punching.since ive started doing this my punches are almost twice as fast with almost no loss in power. every time it hits the bag it sounds like thunder instead of a thump just because of this.thank you so much johnny you are a life saver. 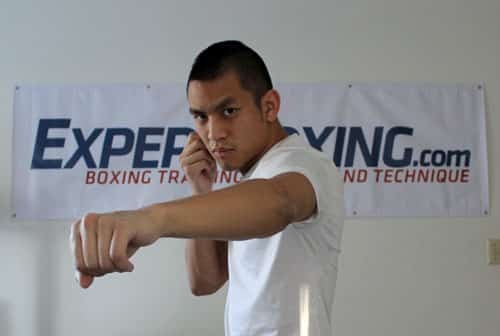 In regards to stretching the inside of the arm, have you ever had any injuries or soreness from hyper extending your elbow when throwing out the jab? I have heard differing opinions on the ‘flicking’ type jab, some positive and some negative. I am interested to hear your response as you are the real deal when it comes to boxing knowledge? I’ve gotten those injuries before but I don’t have that problem anymore because I know how to warm up my joints. The flicking jab is useful in some situations but not in all of them. Skill and experience will tell you when. It’s good because it’s fast and distracting. It can be a vulnerability because it’s not powerful and/or telegraphs too much. Some guys (like long-armed or fast) can get away with it more so than others. So this works for the dominant hand too and not just the jab? Exactly, the technique works for both hands. Wow, just hyper extended my elbow throwing my straight right. I’ve spent some time at a boxing gym so am not completely new but everytime I would just go for range I would do this. I had not heard of this concept but it’s exactly what I needed to know. Thank you! May be we will have different opinions, because sure we have different schools, style and stratigy. 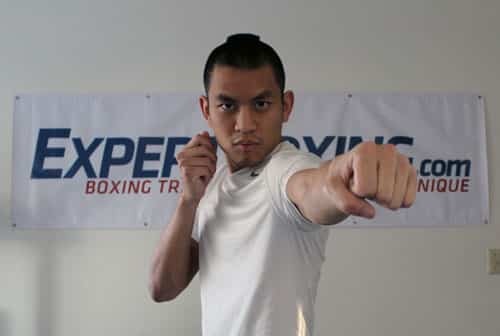 I always in any kind of sport I did practice, I start at the very beginniing to block my oponent, even for few seconds, what we call it Wing Chun Kung Fu, block and attack stratigy. So with it you save time, energy and you stay O.K, why do not you try it, but concentrate on that. Where to block him, it depends very much on your eyes and his movements, I advice you never meet him face to face, but sidely and quickly, but give him a chance one more time, but psychologically he becomes weak and inside he gives up, please believe me, i have long experience with it. Johnny, first of all thanks for all the incredible articles, we cannot thank you enough. I love this article, punching with the simple ‘Stretch the INSIDE of your arm’ in your mind will alone speed up your punches by a TON, it seems like it gives them far greater penetration force, and like you said, your punches will not block your OTHER punches from coming out because of how straight they are… Next time you come have a workshop in L.A I will definitely be there. Can you elaborate on the Right Cross with the similar principles? Please. I did elaborate and talk about this principle and recommended it for all straight punches. Was there something in particular you wanted to know? I just started working with an MMA gym last week. Keep being told that my wrists aren’t straight. This is the best explanation of how to stop that from happening. Thanks for posting! I aim with my middle knuckle, what part of fist do you teach landing with? Either the first 2 knuckles or the middle. I’ll be very glad if I can know how to box and acquire many skills but all those videos that shows everything doesn’t show when I was checking them 1 by 1 why?